Nana Addo Dankwa Akufo-Addo recently urged African leaders to free their people from a mindset of “dependence”. During the talk he chronicled how Ghana and Cote D’Ivoire, and much of Africa, through corruption and undervaluing the continent’s natural resources are being exploited. 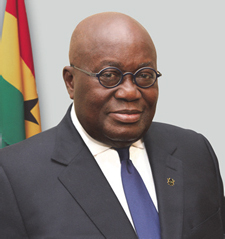 Touching on the cocoa industry, President Akufo-Addo said it’s unfair that Ghana and Cote d’Ivoire, who produce 65 percent of the world’s output of cocoa, made less than $6 billion from an industry worth over $100 billion. “If we simply ground and sold the cocoa in paste form, instead of selling the cocoa beans, we double our earnings. In much the same way as we would double our earnings from gold, if we sold it refined than in its raw state. We are determined to process these products,” he said. It is time African countries are responsible for processing their own resources and managing these resources well to generate wealth for the population, expected to hit two billion in the next 20 years, he said. Not only does Africa suffer from the undervaluing of the cocoa that goes into Europe and America to make everything chocolate, it also suffers from the undervaluing of its mineral resources, as witnessed by Tanzania President John Magufuli’s indictment against Acacia Mining, a subsidiary of Barrick Gold, the world’s largest gold mining industry. The no-nonsense president’s administration calculates, during a period of nearly 20 years of undervalued mineral extraction, that Acacia owes Tanzania roughly $100 billion. Africa’s annual losses, according to the coordinator of the African Minerals Development Center, Dr. Kojo Busia, is in excess of $80 billion, through illicit financial flows, which includes corruption and the siphoning of public money by corrupt African leaders. Home of probably Africa’s richest woman, worth $3.5 billion, and heavily invested, along with many other elite Angolans, in Portugal, is the daughter of the former president of Angola, Isabel dos Santos, who was recently removed from the chairmanship of Angola’s national oil company by newly-elected President Joao Lourenco. Between 2002 and 2015, Angola’s governing elite through companies and individuals “poured” $189 billion outside the country often into “opaque investments,” reported Catholic University of Angola’s Center for Studies and Scientific Research. Former foreign minister of Portugal, and current chair of the country’s largest private bank, Millennium BCP, Antonio Monteiro said investments from Angola had helped many Portuguese companies survive, including his bank. Page, who until last summer worked for U.S. intelligence as a researcher and an analyst, has just completed a book for Oxford University Press co-authored with John Campbell, “Nigeria: What Everyone Needs To Know,” that is part of a series. 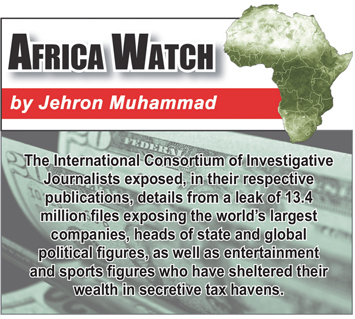 Almost at the same time as this interview, the International Consortium of Investigative Journalists exposed, in their respective publications, details from a leak of 13.4 million files exposing the world’s largest companies, heads of state and global political figures, as well as entertainment and sports figures who have sheltered their wealth in secretive tax havens. In 2016 Global Witness, a London- based nonprofit that exposes international corruption, via CBS News 60 Minutes discovered that the U.S. is one of the most popular places in the world to launder ill-gotten finances. This is done by moving dirty money through a maze of dummy corporations and offshore accounts that conceal the original source of these funds. With the assistance of hidden cameras in law firms across Manhattan and without the lawyers’ knowledge, GW posed as the representative of a government official from a poor West African country, needing help moving millions of dollars of suspicious funds into the U.S. The fictitious story created by GW was based on an actual money laundering case. GW called 50 New York law firms with experience in private asset protection and managed to get face-to-face meetings with 16 different lawyers in 13 firms. The fake representatives’ pitch was designed to intentionally raise red flags and cause the attorneys to suspect the government officials’ millions came from illicit sources. Of the 16 attorneys recorded by Global Witness, in these preliminary meetings, only one lawyer outright declined to participate showing the representative to the door. But if Buhari’s continent wide success is going to be judged by his anti-corruption campaign in Nigeria, maybe there needs to be a second look. And with the 1,124 corruption cases before the courts being proof that Buhari’s Economic and Financial Crimes Commission, headed by Ibrahim Magu, has gained a measure of success, voters, if he chooses to run in 2019, will judge him based on convictions not arrests. Leading the continent’s most visible anti-illicit financial flows campaign is former South African President Thabo Mbeki. The chair of the African Union’s 10-member High-Level Panel on a series called Illicit Flows report, said, “large corporations having the means to retain the best available professional legal, accountancy, banking and other expertise to help them perpetuate their aggressive and illegal activities” are the main culprits.